Vivint is an often overlooked heavyweight in home security, offering high-tech gadgets and automation at premium prices. Home security is an important concern for most people, but there are so many options out there, it can be tough to figure out the best choice for your needs (and interests). Of course keeping your property safe is the primary concern, but for me – and many others – so is staying on the cutting edge of technology. In looking for modern home security options, tech is certainly going to be a major player in the systems you use, but determining how high-tech you want to get is going to be a matter of how savvy you are… And how much you’re willing to spend. If price is less of an issue for you, Vivint offers some serious technology that satisfies both the need for security and (sometimes unnecessary) desire for the coolest new toys. Any time you’re considering installing new technology, it’s important to understand what you want to achieve, what parts of your home you’re planning to protect, and what kind of commitment you’ll have to make to operating the system(s) you choose. Any home security system worth buying will include cameras, door and window sensors, and monitoring to protect against theft/invasion. The sophistication of these pieces, though, will depend on how much you want to spend and how robust you want the features to be. 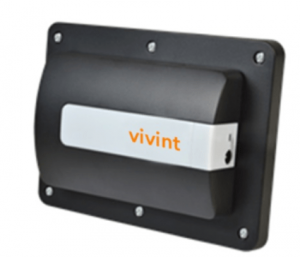 The ideal Vivint customer will be looking for discreet security equipment that blends easily with interior and exterior decor. They will be tech-savvy and concerned with security, and won’t be afraid to fork over premium pricing for stylish, high quality products and services. For those looking for a more traditional setups and monitoring, Vivint may not be the best option. In fact, the services offered go beyond many home security systems in look, features, and your ability to control the system, but all of that comes with a higher price point. Vivint is all about “smart home technology” – meaning that they don’t exactly specialize in home security (even though many of their products fall into that category). It also means that all of this “smart technology” will be dependent on internet, wifi connections, and your smartphone for controls. Being comfortable with touchscreen displays (like the Vivint SkyControl Panel) is also a must for a potential Vivint customer. Vivint services and products are generally bundled together in various packages (including customizable options). We will look at components first, and then the packages that bundle them together. 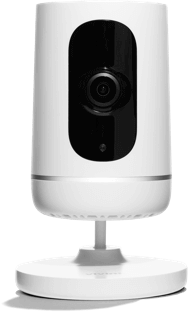 The Ping Camera is a simple video camera and motion detector, accessible from from the Vivint Sky App. It can be placed on a shelf or countertop, and allows you to monitor any activity in your home remotely. You can also receive alerts to your smartphone if the Ping Camera detects motion in your home, access short clips on demand, and have the option to record continuous video footage. 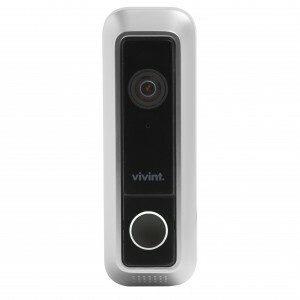 Like other Vivint cameras, the Ping Camera also has night vision – so you can see recordings of even the darkest rooms. 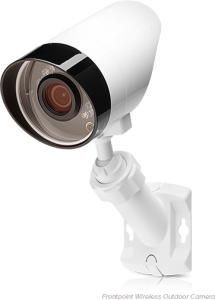 Similar to the Ping Camera, but designed for outdoor installation, Vivint’s Outdoor Camera shoots HD video, offers night vision, allows for monitoring via smartphone, can record continuous footage, and has instantly available 20-second video clips. One of the most impressive pieces of technology in Vivint’s lineup, the Doorbell Camera is a small, wifi connected doorbell fitted with a speaker, microphone, motion sensor, and 180º video camera. You can set notifications for when people approach your door, monitor activity happening in front of your house day or night (with night vision), and communicate with visitors through 2-way talk. Integration with Vivint Sky controls means you can lock and unlock doors with your smartphone or SkyControl Panel, and Smart Visitor Detection helps identify when people are actually approaching – so you don’t get a notification for every passerby. Sensors on doors and windows, including “Glass Break Detection” let you know if anyone is trying to break in, who’s coming and going, and allow you to set mobile notifications for any entry when you aren’t home. 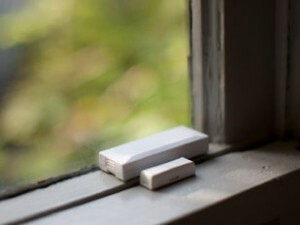 The sensors are all discreet and wireless. Exactly what you might expect from the name, Smart Locks are wireless and digitally controlled, allowing you to lock and unlock doors remotely, either with the SkyControl Panel or your smartphone. The locks still use keys as well, and are also fitted with a keypad for code entry. Like the rest of these products, you can also receive notifications related to any activity with your door locks, attempted entry, and so on. This one is quite simple: the technology integrates with the SkyControl Panel and mobile app so you can open and close your garage door remotely. You can also receive alerts if you’ve left the garage door open. The Vivint Sky App is a way for you to control your home security through a smartphone. Of course, this is where you receive notifications from camera activity or door/window sensors, but it’s also where you can lock and unlock doors, monitor video feeds, arm and disarm alarms systems, open and close your garage door, change settings, manage preferences, and so on. It’s your mobile control panel. The Sky App requires the SkyControl Panel. 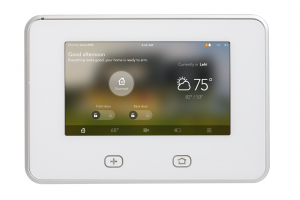 A wall-mounted, 7-inch touchscreen display, the SkyControl Panel is the primary control of your Vivint system. The panel is essentially an expanded version of the app on a dedicated device. You can control all of your cameras, monitor video, lock and unlock doors, manage system options, and so on. Your SkyControl Panel is also connected to 24-hour support, where you can talk live with a monitoring professional in case of an emergency. 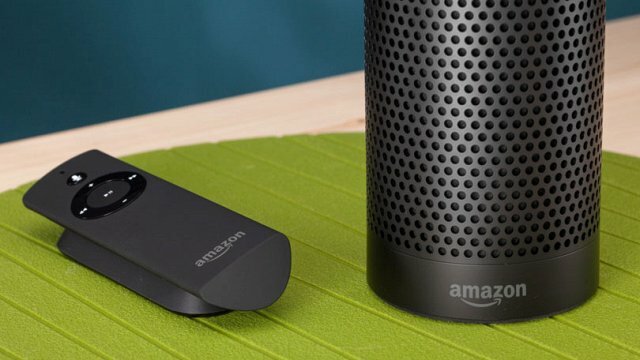 Another futuristic feature of Vivint systems, the SkyControl Panel can easily pair with an Amazon Echo, a voice-controlled Bluetooth speaker. Pairing with Vivint Sky lets you control your security systems through voice commands. The Smart Home Services are the wifi connected, app and SkyControl managed services that accompany some of Vivint’s devices. When signing up for various Vivint packages, you can choose which services you want to include. * Note: Vivint offers “smart thermostats” for remote temperature control and monitoring, but because it doesn’t really fall into their home security category, we haven’t included them in the list of devices and systems. Vivint security systems are generally designed to work in conjunction with one another. While equipment can be purchased and installed individually, the packages seem to offer the best functionality, and create the most complete security systems. Most packages, including customizable options, include the SkyControl Panel. 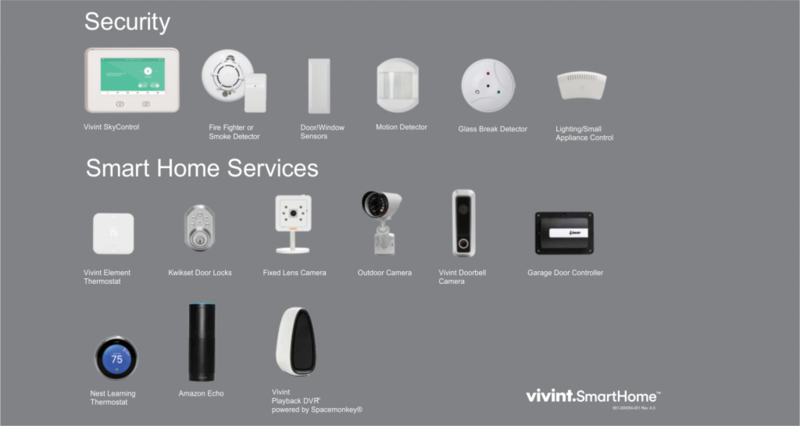 The most robust package available, the Smart Complete package includes the SkyControl Panel, 1 smoke detector, 3 door and window sensors, 1 motion detector, 1 yard sign, a 1- terabyte wireless cloud storage drive (for on-site storage of photo and video), Vivint’s 24×7 monitoring service, and your choice of 3 Smart Home services. The “middle tier” package, Smart Protect & Control includes the SkyControl Panel, 3 door and window sensors, 1 motion detector, 1 smoke detector, 1 yard sign, 24×7 monitoring service, and your choice of 2 Smart Home services. What you could consider the “basic” option, the Smart Protect package includes the SkyControl Panel, 3 door and window sensors, 1 motion detector, 1 smoke detector, and 1 yard sign. The Smart Protect Package does not include any Smart Home services. Vivint allows you to build custom packages of devices and services, as well as add extra cameras, services, sensors, storage, and the like. If something isn’t offered in the package that seems to best suit your needs, you can add it for an additional cost. Smart thermostats and other smart home controls are available in some packages, and can be added on as well. ADT is one of the most recognizable names in home security. Their track record speaks for itself, and they have remained an industry leader for decades. Like Vivint, ADT offers full home installations by professional service technicians. Monthly service fees for monitoring are comparable, but Vivint’s installation prices tend to be much higher than ADT, and actually increase as you move toward more basic packages. Price: Plans are comparable, and equipment prices for ADT are hard to determine – as they offer consultations and home visits to build packages. Not seeing equipment price up front may be a turnoff for some customers. Vivint equipment is generally free with installation and contract signing. Features: ADT features tend to be more basic, with less automation and control than Vivint’s technology. 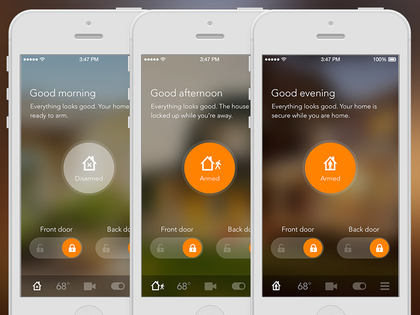 In short, Vivint has more features and ADT has more stability. Learn more about ADT here. Frontpoint is another relatively high tech home security solution, similar in design and control to Vivint. Like Vivint, Frontpoint also offers the option to upgrade packages and add devices. Frontpoint has a reputation for excellent customer service, a low-pressure sales teams, and offers many of the same features as Vivint. Price: With Vivint, you pay for installation and the equipment is mostly free. With Frontpoint, it’s the opposite – installation is DIY (and therefore free), but you pay for the equipment. Features: Many of the offered features are the same, but Frontpoint offers a wider selection of equipment to meet your exact needs. 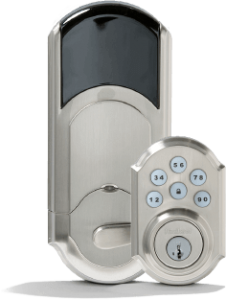 Both offer 24/7 monitoring, motion detectors, cameras, etc., as well as smartphone integration and a touchscreen control panel. Warranty: Frontpoint offers a 3-year warranty, where Vivint offers a lifetime warranty. Contracts: Frontpoint contracts are 36 months; Vivint contracts are typically 60 months. Check out more Frontpoint information here. Protect America has garnered a reputation as one of the more affordable options in home security, immediately putting them at the opposite end of the spectrum from Vivint. Instead of a focus on technology and numerous features, Protect America focuses on simplicity and ease of use. Both companies offer free smartphone apps and free equipment with contract signup. Price: With monthly plans as low as $19.99, Protect America is generally the more affordable option, though some of the more premium offers fall into a similar price range as Vivint packages. Features: Vivint products offer more bells and whistles, including outdoor cameras and automation features – which must be installed by professionals. Protect America’s equipment is also filled with features, but requires a DIY installation and may not meet all of your concerns. Warranty: Both companies offer a lifetime warranty, and Protect America offers a 2-week, free return policy. Vivint does not offer a return policy. Contracts: Protect America offers 36-month contracts; Vivint offers 60-month contracts. Find out more about Protect America here. However, two major hangups become increasingly apparent as you dig into Vivint’s offerings. First, Vivint is a generally more expensive option than its competitors, perhaps without enough of an improvement in features to justify the cost. Second, the offers themselves can get confusing. The website advertises SkyControl panel for all packages, but in speaking to a customer service representative, I was told that some packages may come with an older model panel – which also means using the Vivint Classic App, not Vivint Sky App (which only works with the newer panel). If you’re going to opt for one of the top-tier packages, and can afford it, Vivint seems like a fine option, and you can further customize the products you install to make sure you’re getting the most out of your system. If you are looking for a budget security system, plan on moving in the near future, or would be considering a smaller, custom package, Vivint is likely not the best choice – and may end up costing far more than anticipated. Overall, Vivint is suited for tech-loving, automation seeking homeowners who are willing to pay extra for premium features, installation, and sleek looking gadgets.